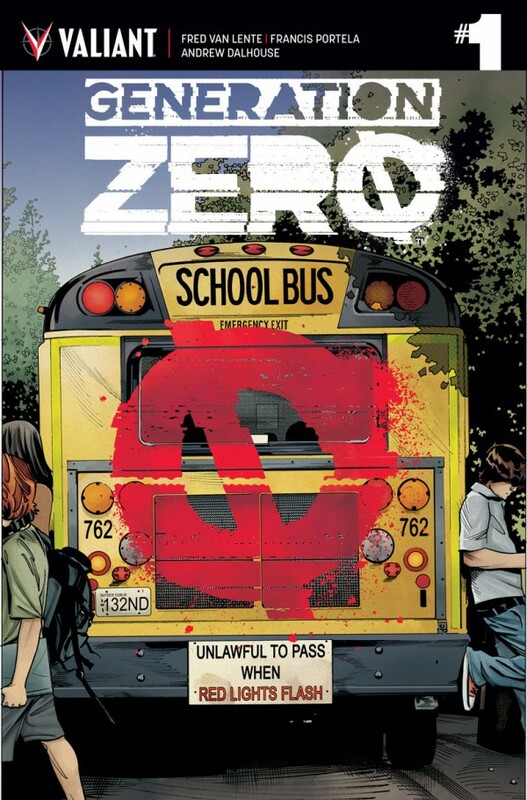 "If you have a problem... if no one else can help... and if you can find them... maybe you can hire..." Generation Zero? That line comes from the 80's hit TV show 'A-Team' where every week a band of former commandos helped ordinary people with extraordinary problems. Generation Zero is Valiant's group of psiots from Harbinger Renegades with a similar premise but for the digital age. However, the star of Generation Zero #1 is not this team of powerful do-gooders at all it's a teenage girl named Keisha Sherman. Fred Van Lente and Francis Portela have made their heroes practically non-existent in the first issue of the book that bears their name. In doing so, they've created a compelling and engaging lead character out of normal high schooler Keisha. Her boyfriend Stephen stumbled across a secret he was going to share with her before he suddenly died in a car accident. Suspicious of the circumstance surrounding his death, she's looking for answers and tries to contact Generation Zero for help. Keisha, the Sheriff's daughter, is a confident punk rock kid well aware of her niche in high school. She sees herself as an outlier away from the in-crowd but with plenty of friends and a determination to find out what really happened to her boyfriend. She takes it upon herself to "Nancy Drew"-it when a response from Generation Zero seemed unlikely. Van Lente develops such a likable, level-headed, relatable, and smart character in Keisha I'd be happy following her exploits with or without Generation Zero. That's probably not what Van Lente wants to hear or intended. It's not every week a young person of color becomes the face of a new comic book series so the emergence of Keisha is refreshing and sorely needed. The book will become more of an ensemble, a team story, going forward as they try to unravel this mystery but it's already off to a wonderful start. Portela, whose done fantastic work on Valiant's mega-hit Faith, continues to shine on Generation Zero. The amount of detail coupled with dynamic layouts keeps the action moving without sacrificing backgrounds or character designs. The creative use of grids to display a sequence of events or emotions is used sparingly but effectively especially in a scene with Keisha sitting in a car. Andrew Dalhouse's colors are subtle in backgrounds but bolder with the characters using richer hues in clothing, hair, and skin tone. It's just a beautifully illustrated story in every way. To fans of Valiant comics, Generation Zero's brilliance should be no surprise. If you're new to Valiant, this is a great place to start. Van Lente has a star in Keisha Sherman and we haven't really seen Generation Zero show up yet. It's a testament to good writing and world-building that this debut issue is so arresting. With great art from Portela & Dalhouse and an involving mystery, Generation Zero is poised to be another giant hit for Valiant. Get on board now!